When grill is heated, place bacon on bottom grill surface. (If necessary, cook 4 slices at a time.) Close grill; cook 3 to 4 minutes or until browned. Remove bacon from grill; drain on paper towels. Cut bacon slices in half crosswise. With rubber scraper, carefully scrape most of drippings from grill into drip tray. Add onion to grill. Close grill; cook 4 to 6 minutes or until tender. 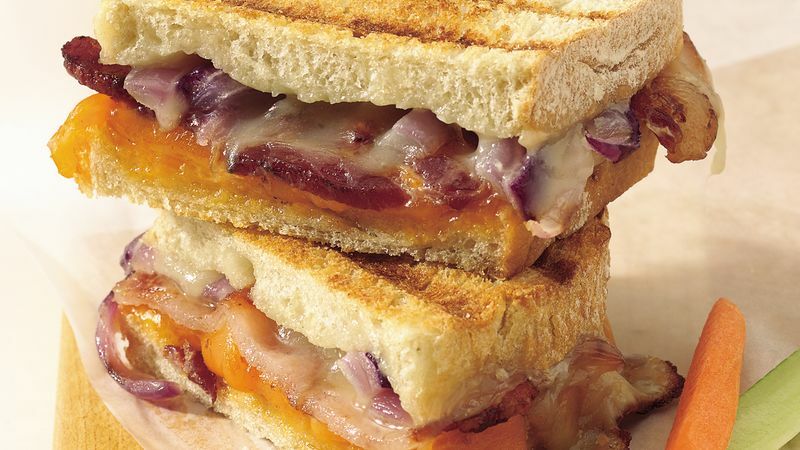 To make sandwiches, layer Cheddar cheese, cooked bacon, onion and mozzarella cheese between bread slices. Place 2 sandwiches on bottom grill surface. Close grill; cook 3 to 5 minutes or until bread is toasted and cheese is melted. Repeat with remaining sandwiches. You can use almost any bread you have on hand for this sandwich. We've called for sourdough or Vienna because these are firm textured and grill well. Other good choices include Italian bread, large French bread slices or country French bread slices. These sandwiches are great for lunch or supper. For lunch, serve them with cut-up fresh vegetables and fruit. For supper, add deli potato salad and pickles.